Moms & Munchkins is so excited to introduce you to The Breast Friends. These wonderful women have been writing national best selling cookbooks since 2004. I’m also proud to say that they are from Saskatchewan, Canada! I have two of their cookbooks (they currently have 6) and I can honestly tell you that the Breast Friends recipes are delicious. What makes these women truly inspirational is that they are writing these cookbooks to raise awareness of cancer prevention & support. From the sales of their cookbooks full of Breast Friends recipes, they have been able to donate $1,363,000 to cancer initiatives. Their story, recipes and cookbooks have been shared worldwide which is pretty amazing for a group of women from a small town in Saskatchewan! Want to purchase a cookbook for yourself or someone you care about? Visit BreastFriends.ca to purchase a book online or for a listing of Canadian retailers that have the books for sale. They’ve been kind enough to let me post two of their recipes here. Both of these Breast Friends recipes are perfect for holiday entertaining! Be sure to check out the healthy tips from Breast Friends at the end of this post. This delicious mocktail recipe is perfect for a moms night in gathering or to enjoy at a holiday party. 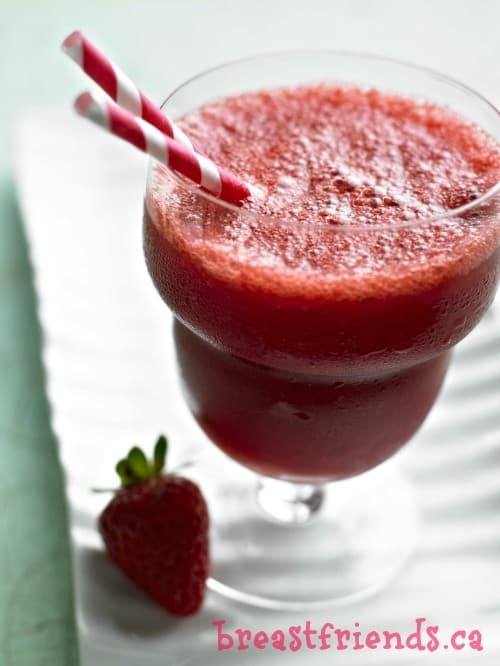 In a blender, place the strawberries, syrup, lime juice and ice cubes. Pour into a brandy snifter or large wine glass. Did you know that maple syrup has fewer calories and more minerals than honey and is a healthier substitute for sugar? Maple syrup is a good source of manganese and zinc. Manganese supports your body’s enzymes which are important in producing energy and for antioxidant defenses. The enzyme called superoxide dismutase, which stops free radical damage to the body, requires manganese to work. As with any sweetener, remember to use it in small quantities. 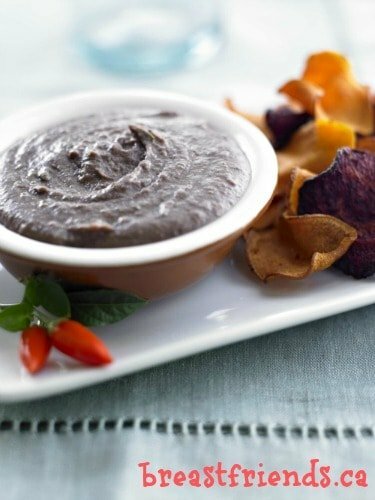 Not only is this a delicious dip, it's also healthy! Dig in! Some canned beans have more liquid then others, so you may have to drain some liquid off. Serve as a dip for veggies or pita chips. Did you know that black beans and other legumes are a healthy, inexpensive source of protein and nutrients including B vitamins, folate, calcium, iron, potassium and zinc.? Some health experts recommend eating them twice or more weekly, especially when they’re prepared at home (rather than from cans). Home-cooked beans are more easily digested and therefore the protein, vitamins and minerals are better used by the body. Beans contain hard-to-digest substances which can be inactivated through proper preparation. Black beans are high in antioxidants that stave off aging and illness. Zinc, for example, is an antioxidant mineral that is involved in many aspects of your immune system, and it also balances copper in the body (too much copper may promote cancer). Beans have certain carbs that reduce the effects of enzymes in the intestines that may cause cancer, and fibre which helps eliminate toxins. Did you know that tomato paste has the most concentrated form of the disease- and infection-preventing antioxidant called lycopene. In fact, ⅓ of a small can contains the recommended daily dose of lycopene. Lycopene is best absorbed with oil so consider adding 2 tablespoons of olive oil to recipes including tomato paste. Tomato paste also has fibre and protein, vitamins A, B and C, and biotin. It has minerals like potassium, phosphorus, magnesium and calcium. Where possible, try to use no-salt-added brands. Did you know that the flavonoids in cocoa may not only help to prevent cancer, they might protect your heart by preventing blood clotting and helping to lower blood pressure. Cocoa has many antioxidants: 8 times the number of antioxidants found in strawberries, for example. One of its antioxidants called epicatechin has been shown to reduce LDL cholesterol (bad cholesterol) by up to 10%. Cocoa also has minerals: potassium, zinc, iron, calcium, phosphorus, copper and manganese. If you’ve loved these Breast Friends recipes, be sure to pop by their site to let them know! Never miss an update by following us on Facebook, Twitter, Pinterest and Bloglovin’. This is not a sponsored post. I honestly appreciate the work these amazing women are doing and I am so happy they let me feature them on Moms & Munchkins. The Fresh Strawberry Daiquiri Mocktail looks incredible, I’m going to have to try it! Great cause too!! I love mocktails and bean dip. Thank you so much for these recipes! Great recipes and a great cause! Definitely a book i’ll keep my eye out for! I love browsing cookbooks! These sound awesome, and the recipes look delicious. Love these recipes. I had never heard of the cookbooks but will definitely look for them now. The black bean dip looks amazing!